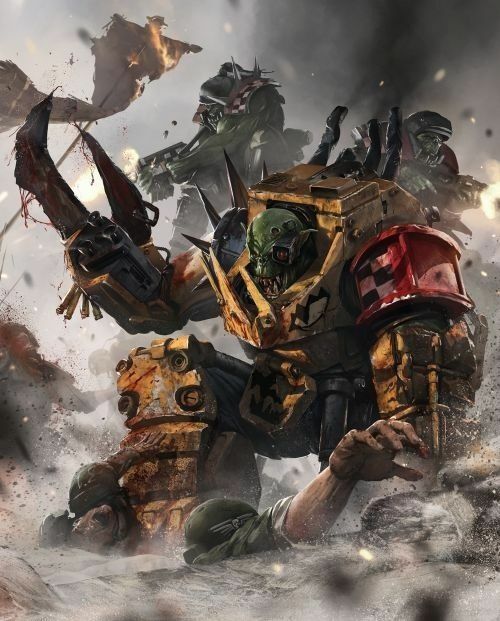 Hi guys, today we take a deeper look into the Ork codex and see what makes Orks good and also what units are down in the dirt in the current meta. ‘Ere we go! – Now this rule was in the old book but one simple change has made it awesome, you can now re-roll all or any of the dice when rolling charge rolls for units with this ability. This means all your awesome combat units such as Boyz, Nobz, Gorkanauts and the like will be seeing a lot more combat. Woo! Mob Up – I love this stratagem, it allows a unit of 10 or more models and a unit of 10 or less models to merge into one big squad for the rest of the battle at the end of one of your movement phases. These units must be within 2” of each other when they merge and must have the same datasheet. This allows you to have for example a unit of 40 Boyz or 20 Nobz. Imagine how many attacks that is in combat!! Dakka! Dakka! Dakka! – This rule is great right now. It says that hit rolls of 6+ made for ranged weapons succeed regardless of any modifiers, amazing considering so many armies can get a -1 or -2 modifier to hit these days. That’s not all, it also says that these unmodified hit rolls of 6+ give you an additional hit roll at the same target with the same weapon. All the Dakka! More Dakka! – If you thought that was it for dakka you are mistaken. This stratagem is used before an ORK unit from your army shoots in your shooting phase and means that unit’s Dakka! Dakka! Dakka! ability is triggered on unmodified hit rolls of 5 or 6, instead of 6. These 2 in conjunction with each other are amazing it means a unit will always hit on rolls of 5 and 6 and generate additional shots for all those hits, meaning an army of shooty Orks can stand toe to toe with a Tau army and have one hell of a close gun fight. Pew Pew! Bad Moons Kultur: Armed to da Teef – This is one of the more useful Kulturs for your army if you do want to go Dakka heavy as it allows models with this Kultur to re-roll hit rolls of 1 for attacks made in the shooting phase. Lootas with Bad Moons Kultur – The perfect time to slot in this powerhouse of a unit for the new ork book. This unit fires D3 shots per model at S7, AP-1, D3 damage. So imagine what would happen if this unit was to Mob Up into a unit of 25 Lootas and fired 3 shots per model using the More Dakka! Stratagem and Bad Moons Kultur for re-rolling 1’s. Just as an average that would kill 2 and a half Talos which are one of the toughest units in the game right now. Now because they are bad moons you can use the Showin’ Off stratagem to fire again and absolutely decimate what you shoot at. That means this one unit in your army would averagely kill 5 Talos which is crazy strong or even take down a Knight with 24 wounds averagely!! WHAT!! Grot shields – This is a great stratagem, it means when an Ork infantry unit is wounded by an attack on a 2+ you can choose to slay a gretchin from a friendly gretchin unit within 6” of the wounded unit, as long as the gretchin unit is closer to the attacker. This means your units such as Lootas for example are protected when they get shot at by the enemy. Absolute bargain for only 1 CP. Mek Gunz – For their points these are some of the best units in the whole book. The gun you want is a Smasha gun, this bad boy fires D3 shots at AP-4, D6 Damage and rolls 2 dice and must equal the opposing units Toughness to wound. For only 31 points that’s almost an auto include for me. Weirdboy – These little characters are great for buffing the rest of your force and also for mortal wound access. Now for every 10 ork models within 10” of them, they can add 1 to cast powers up to a maximum of +3. So if you roll a 8+ your smites will be doing an amazing D6 mortal wounds. Other great powers for them to have are Warpath, giving a unit +1 to their attacks characteristic, Fist of gork to give a character +2 to Strength and attacks characteristic, and also Da Jump to remove a friendly infantry unit from the board and set it up anywhere on the battlefield more than 9” from any enemy models. Evil Sunz Kultur: Red Ones go Fasta – This in my opinion is probably the best kultur to choose for your combat units as it adds 1 to their move characteristic and also to their advance and charge rolls. This counters the low move characteristic orks have and will definitely help get your combat units to battle. Warboss of DOOM – An absolute BEAST for your army. Standing tall at only 80 points this character will ruin your opponents day. First you give him the Brutal but Kunnin’ warlord trait and da Killa Klaw Relic, then you cast Fist of Gork and Warpath on him and he should averagely kill a 480 point Knight Crusader in combat. Earning back 6 times his points value. What a MONSTER! That’s enough good stuff for one day or you might get giddy and faint. Meganobz – at only 35 points I think they are playable but do not have enough attacks or shots to do considerable damage and once you buy them a decent transport like a battlewagon, you’ll find a unit of 5 plus the transport has cost you almost 300 points which is more then a unit of 40 Boyz which have a crap tonne more attacks and shots. Stompa – For me this is the most gutting unit, sad Mani! I love Stompas, I think they are such cool models but unfortunately this bad boy costs more then a Knight Castellan and probably does about half the damage. I wish these were cheaper or better. Flash Gitz – These guys have some awesome guns man. They put out 3 shots each at S6, AP-2, 2 Damage, which is great but then you look at their points cost. These Pirate shooters cost a whopping 30 points per model. I’m Gobsmacked! Snakebites Kultur: Da Old Ways – One of the worst Kulturs to go for. It gives your units a 6+ feel no pain roll, but you could just buy a cheap painboy who does the exact same thing and then your entire army can benefit from the 6+ feel no pain and have a different Kultur bonus aswell. Da Old Ways are pointless if you ask me. There are a few more good units and bad units in the book but those are for you to play and discover yourselves my minions. I hope this article will help you Ork players to narrow down the units you should and should not take in your competitive armies, and I hope it’s given you none Ork players a few thing to watch out for when crossing them on the battlefield. If you enjoyed this article be sure to check back on this website every Thursday as a new article drops for you to feast your eyes on. Next post: Chapter Approved – Both Sweet and Sour!